Desert Essence Natural Toothpaste is one of the freshest toothpastes I have seen here. Right now, it is hanging out at 4.5 stars on Amazon, as well as sporting their badge for Amazon's Choice. Why don't we dive right in and see if it is really as good as people think. Desert Essence Natural Toothpaste is a fluoride free toothpaste that relies on other alternatives to get the same results. The reasoning behind the elimination of fluoride is because fluoride is considered toxic to the body, but only when ingested at low to high amounts. However, it is also a big ingredient that prevents tooth decay and cavities. And since toothpaste is not meant to be swallowed, the addition of fluoride has been standard in toothpastes for decades. The biggest case for fluoride-free toothpastes is when there is a small child in the equation. Children tend to eat just about anything. So if they were to accidentally swallow their toothpaste, it could potentially be toxic to them. This natural toothpaste is based around two main ingredients. Neem and Tea Tree Oil. Neem is a leaf extract that is widely known for its dental benefits, while Tea Tree Oil is a natural antiseptic. The rest of the ingredients in Desert Essence Natural Toothpaste are all natural and pretty great. They are as follows: Calcium Carbonate, Glycerin (Vegetable Derived), Water (Aqua), Melaleuca Alternifolia (Tea Tree) Leaf Distillate, Sodium Coco-Sulfate, Carrageenan (Plant Derived), Gaultheria Procumbens (Wintergreen) Leaf Oil, Sodium Bicarbonate, Eco-Harvest® Melaleuca Alternifolia (Tea Tree) Leaf Oil, Melia Azadirachta Extract (Neem), Sea Salt. There are two fairly controversial ingredients that they have included here. Glycerin and Carrageenan. However, both of which are naturally sourced. Glycerin being vegetable derived and Carrageenan being plant derived. Plus, the whole controversy about glycerin leaving a film on your teeth does not stand up well when put under pressure. Since glycerin dissolves in water, it is very unlikely that any of it would be left on your teeth. Desert Essence Natural Toothpaste has a few certifications on its toothpaste. One of which is cruelty free, which means that there was absolutely no animal testing for this product. It is also vegetarian and gluten free, for those of that lifestyle or if you have a gluten allergy. With Desert Essence Natural toothpaste, you are getting a lot, as well as avoiding a lot. Their natural toothpaste is free of any animal testing, parabens, sweeteners, harsh abrasives, artificial additives, petroleum compounds, paraffin, glycols, phthalates, and so much more. The stuff you get with this toothpaste is a recyclable tube that is also biodegradable, as well as made from renewable resources. So yeah, there is a lot of great stuff around this particular natural toothpaste. Desert Essence has been a leader in natural personal care for the past 35 years. They have made their mark by using nutrient rich desert botanicals like Aloe Vera, Jojoba and Tea Tree Oil. And it is not just toothpaste they are making. Their products range from skin care to hair care, and everything in between. However, since we are talking about their dental care, there is a lot they have in that department. Just in their natural toothpaste line, they have 7 different types and flavors. They have a coconut oil toothpaste, a neem toothpaste, and of course a neem and tea tree oil line, all featuring different and unique flavors like Fennel, cool mint, cinnamint, and more. Desert Essence Natural Toothpaste does not contain any artificial additives. This means no fragrances, dyes, or sweeteners. It also does not contain any fluoride, which is one of the most popular of the controversial toothpaste ingredients. 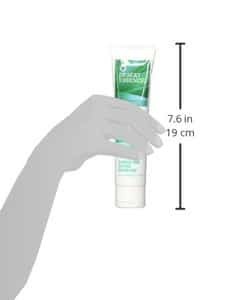 With Desert Essence Natural Toothpaste, you can rest assured that you are buying something that is made to help the environment and its inhabitants. This natural toothpaste is free of all animal testing, toxic additives like parabens and phthalates, and is both biodegradable and recyclable. This is a very natural, natural toothpaste. All of its ingredients are naturally sourced, even the fairly controversial ones. In addition, the toothpaste is built around Tea Tree Oil and Neem leaf extract. Both of which are known to have many dental benefits. For those either with an allergy or living the lifestyle, Desert Essence Natural Toothpaste is both gluten free and vegetarian. Since it can be sometimes hard to find products to fit your needs, this might be one less thing you have to worry about. There have been various reports from some consumers saying that they had a bad reaction from using this toothpaste. While this toothpaste does not use SLS, it does contain a sulfate in the form of Sodium coco-Sulfate. For those allergic or highly sensitive to SLS, this can still affect them. However, not to the extent that SLS can. Some customers have also complained about the taste of this toothpaste. However, not for the reason you may think. They were actually complaining about the taste being too strong. But each person's taste is different. Unless you have a sensitivity to SLS, you should be perfectly fine using this toothpaste. However, if you are sensitive to SLS, the Sodium coco-Sulfate may still affect you. That being said, if you do not have a reaction to SLS, you are well in the clear. Desert Essence Natural Toothpaste is a great toothpaste that really gets the job done, and in a natural way nonetheless. The Tea Tree Oil and Neem leaf extract are sure to keep your mouth happy and healthy. For most people, Desert Essence Natural Toothpaste is going to be a great toothpaste for them. I feel safe recommending this toothpaste as it really gets your teeth clean and it does so naturally. Right now, you can grab yourself a 6.25 ounce tube of their Wintergreen flavor for $6.57 on Amazon. For more information on the best natural toothpaste, check out the rest of Green and Growing. Here are some top questions that I found for people seriously considering buying Desert Essence Natural Toothpaste. Is this more of a gritty paste or smoother gel? It is definitely not gritty. It is very smooth but not a gel. Is this toothpaste good for someone with a cavity? Yes! It's prone to help people strengthen their teeth. How long does a single tube normally lasts a single individual, brushing twice daily? You can probably get about 3 months worth if it's just using it. It's a bit pricey, but totally worth it.